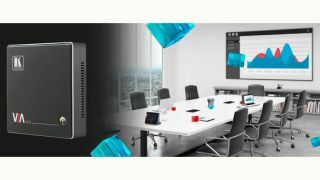 Kramer has introduced VIA GO, a simple, straight forward way to walk into a meeting room, connect quickly, and begin presenting at the highest quality (for iOS, Android, Chromebook, PC, and Mac). VIA GO is part of Kramer's complete VIA product line and is now available worldwide. VIA GO can create its own WiFi network for users to connect directly or it can sit on the internal WiFi network. It has simple wireless presentation, with mirroring for iOS, Android and Chromebook and is fully capable of content streaming with smooth 1080p60 video quality from any BYOD or laptop. VIA GO provides also peace-of-mind through 1024-bit encryption.